For you fund sales person and marketer. To get spot-on views of your clients & prospects portfolios and underlying mutual funds. We help mutual fund sales & marketing teams operate more efficiently by providing institutional fund ownership content online. What are fund of funds buying from your competitors in a given territory? 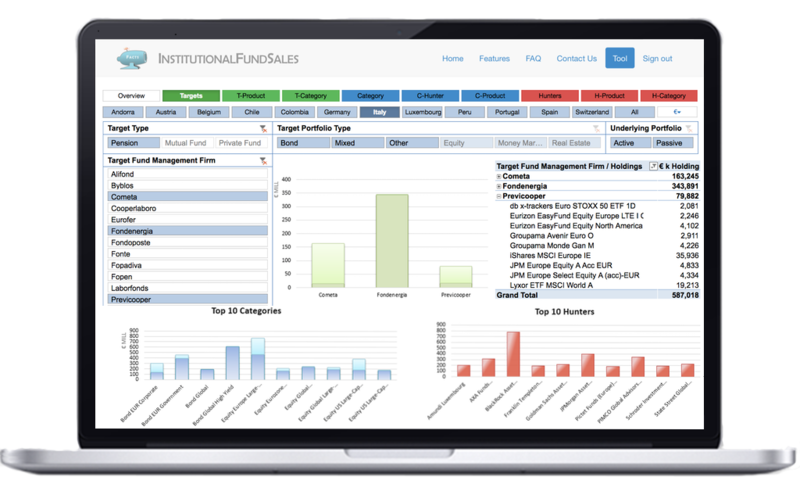 What fund categories are being added into your prospects portfolios? Know what your prospect or client fund management company holds at a portfolio or aggregate level. Opportunity discovery, presales homework.Discover green areas you could explore to grow your firm´s AUM. Find out the fund categories your clients demand.Identification of prospects that follow a specific investment objective or asset type has never been so straightforward. Analyze your competitors´ foot print.Check out your peers´ position with clients and prospect clients, both at portfolio level and aggregated by competitor. “Clients with aggregated € 8.4 trillion AUM trust us to support their commercial and marketing teams. We are proud of that”. “Great market intelligence service!, our commercial activity got up a few notches”. “With IFS I became succesfull in achieving sales in a territory I was not so familiar with”.